I had heard About Sapa, read about it and seen it on TV and the internet, but none of it compares to actually having seen this famous landscape, Ham Rong Mountain in particular, with my own eyes. Ham Rong, with its own beauty of flowers, of stone, of air, contributes to the seductive appeal of Sapa. Why don’t you come and discover Ham Rong Mountain as well as Sapa for yourself? It’s worth it, I promise! Ham Rong Mountain, which belongs to the majestic Hoang Lien Son Range in Sapa District, Lao Cai Province and is about 30 kilometers from Lao Cai Town, looks like a jaw of a dragon opening wide to the sky. 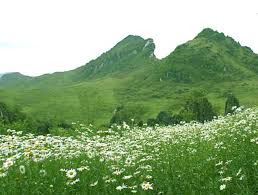 It is an ideal destination for those who want to conquer a height and contemplate the wild and beautiful nature of a mountainous region with the clouds flowing gently above and the peaches blossoming everywhere. To me, a southerner who made her first trip to this mountain, Ham Rong had a different beauty in my eyes on these sunny April days of summer with warm sunlight and a slightly cool breeze covering me all the way to the mountain despite the absence of clouds, cold air and cherry blossoms. Legend says that long ago when Sapa was part of the ocean two dragons who were brothers came here to play. When their father called them back home, only the older dragon made it back while the younger lost his way because the gate of heaven was closed. This dragon had to stay forever in the earth and his body turned into the mountain with his head towards the sky where his family was. 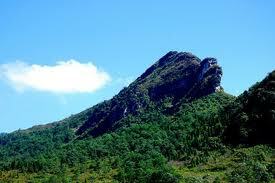 That’s why the mountain, at a height of over 1,700 meters above sea level, was named Ham Rong. “Come on, move your feet, there are many interesting things ahead,” my fellow traveler wakes me up by his voice while I am standing for a while breathless from climbing the stone stairs leading to the mountain. He lends me his hands and drags me to catch up with our troupe. We pass many rows of trees when suddenly my eyes are overwhelmed by bright sunlight and a barrage of colors from a flowered plain. All of this space is covered with flowers including orchids, hydrangeas (hoa cam tu cau), daisies, gladioli (hoa lay on) and azaleas (hoa do quyen) among others with bees and butterflies and bugs alighting on them and birds singing melodious in the trees. At that moment, all my tiredness vaporized and I thought myself lost in a fairyland while my hands were busy snapping as many photos as possible as if it would all disappear if I was late capturing the images. Being so absorbed in the landscape, I was left behind by my troupe. Then, I tried to move fast but was interrupted by the imposing scene of hundreds of stone poles in diversified shapes and heights standing in front of me, a collection called Thach Lam, or Stone Forest. If travelers come to Ham Rong in the spring, they will be treated to Stone Forest covered with beautiful cherry blossoms. “Here you are! What took you so long?” my friend gives me a radiant smile and we come together with our troupe to get to cong troi, or heaven gate, but the path is now narrower, wide enough for only one person. We wait for each other, and one by one, get through to the gate to contemplate the endless blue sky above. Once passing there, all 15 of us stand still and admire the panoramic view of Sapa Town below and the impressive mountains far away at the horizon. The place where we stand is called san may, or cloud yard, where there is a small tower for people to see all of Sapa from a height of 1,600 meters, so magical and fanciful. At that moment my heart was overwhelmed with an indescribable feeling. It could have been my cheerfulness at conquering the mountain as I am not a wealthy girl and this was my first time at Ham Rong, the mountain I have long dreamed of seeing.